Big News: Synthetic Division Going on Tour! No, not a tour of duty- the military hasn’t lowered standards enough to accept a soldier like me. Instead, I’m taking my music on the road to promote the release of A Symptom of Life... check out the tour schedule below! Follow the red line- that will be me starting on Tuesday, May 11 and going through Saturday, May 22. Synthetic Division will be on the road supporting the new album and opening up for our friends in Bella Morte. Then we do a few shows on our own before reuniting with Bella Morte for a big homecoming show in Charlottesville on Saturday, May 22nd at the Southern Music Hall and Cafe. I’m unofficially calling this tour “And the Bands Played On”. I can’t tell you how excited I am about this. I’ve wanted to go on tour with Bella Morte for years, but always put off the idea, instead choosing to just play shows locally once in a while (which is cool!) or do whatever else comes up. But now is the right time, and I’m kind of glad I didn’t pursue the idea before. I’ve spent a lot of 2010 writing new music about this journey- the big picture stuff. I also revisited older songs that needed a fine tuning, and am so excited about the 8 tracks that comprise the LP. Aside from having a sound that I am proud of, I’m glad I’ll be surrounded by friends on the road. Not only that, I’m very thrilled about my partners for this venture: POZ and MTV Staying Alive! Both are just as enthusiastic as I am about the inspiration behind the new music and my desire to just get out there and share the songs live. Poz and Staying Alive are going to help to spread the word as I bounce from city to city on a wave of synthpop, iced mochas and anti-retrovirals, and I really can’t thank them enough for supporting this. It means a lot to have folks so invested in HIV prevention- as well as the support of those already living with HIV- behind this tour. And speaking of prevention- One Condoms are also on board, providing free condoms which I’ll be handing out at the clubs. How friggin’ cool is that? Wait- you’re bummed because you want free condoms and synthpop, and that red line above isn’t rolling through your neck of the woods? 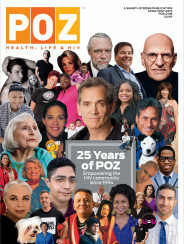 Well, the good news is that I’ll be posting videos from the road with the help of POZ TV- so look for some zany misadventures once I hit the road. In the meantime, I’ve uploaded the title track from Symptom below- just click on the album cover to hear the song. I hope you enjoy it- and I hope to see some of you on this journey.